An 80,000 sq ft interactive mini-city, KidZania® combines play with learning through a fun and innovative approach! KidZania® is an award-winning children’s ‘edutainment’ concept, located in The Dubai Mall, and introduced to the Middle East region for the first time through an exclusive partnership with Emaar Retail! As in the real world, children perform “jobs” and are either paid for their work (as a firefighter, police detective or journalist for example) or pay to shop or be entertained. The indoor theme park is built to scale for children, and accurately reflects the workings of a typical city through paved streets, vehicles, a functioning economy, and recognizable destinations in the form of “establishments”. KidZania® features offices, university, fire station, race track, radio station, pizzeria, hospital, bank, theatre and ATM machines amongst others, all scaled down to a smaller, child-friendly size. Children dress up in real-life uniforms and perform realistic professional tasks in a fun and meaningful way. 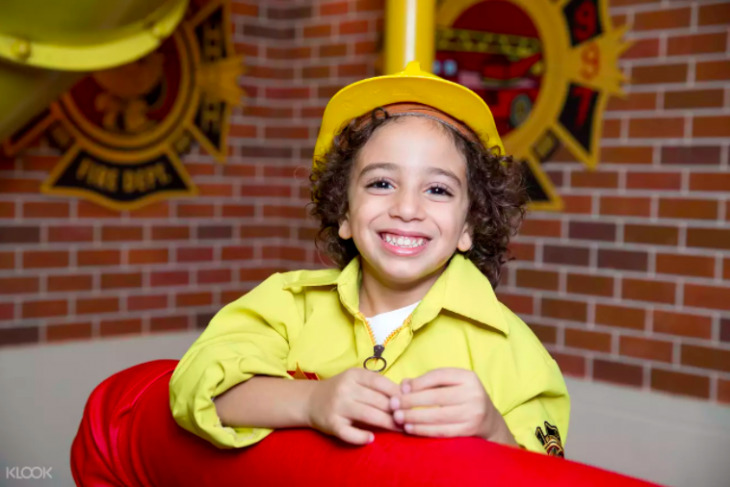 There are over 70 different roles to choose from including that of surgeons, firefighters, chefs, engineers, models, actors, artists, radio hosts, photographers, television hosts, jewelry designers and mechanics among others, making each visit to KidZania® a new and exciting experience for children! Mon–Wed 10:00–22:00, Thu–Sat 10:00–23:00, Sun 10:00–22:00. Inside The Dubai Mall, KidZania is situated on Level 2 (opposite Reel Cinemas).